TF Hamish's stud fee for the 2018/2019 season is $450 with a LFG. Hamish was bred on a 14000 acre Sheep and Beef Station on the Wairarapa's East Coast. 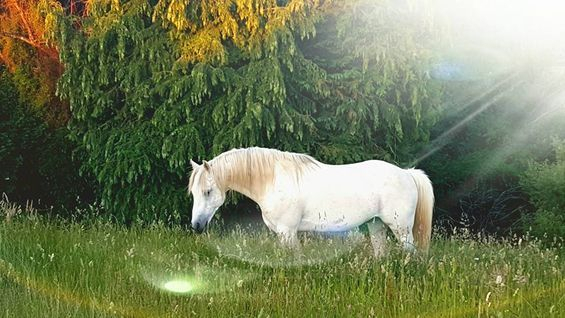 He was foaled on December 5th 1999 out of a partbred Arabian mare of Ngapa descent, by a Stationbred Stallion of mixed breeding. Hamish is not a big stallion and stands at 14.3 hands but what he lacks in stature he more than makes up for in substance, temperament and athleticism. Hamish has delightful ground covering paces, excellent bone and exceptionally strong feet. He also has a fantastic constitution and has never been lame or unwell. If you are looking for a stallion to add hybrid vigor, great character and movement to your mare, you really should check him out! We love Hamish for his eye catching good looks, his kind and gentle disposition and his ability to stamp each and every one of his foals with his very best features. He is one of the easiest horses I have ever had to handle and is a complete delight to have on the property. You can see more photos of Hamish in the Photo Gallery or on the Blog and don't forget to check out the Video Page. * Stud fee excludes handling fee of $150. This is payable in advance and non-refundable. Grazing and vet costs extra.